I’ve started an 18 month freelance contract for Beaford Arts. My work is to digitise 10,000, 35mm, black and white negatives, of James Ravilious and Roger Deakins. These date from 1971 to 1989 and cover all aspects of life in rural North Devon. 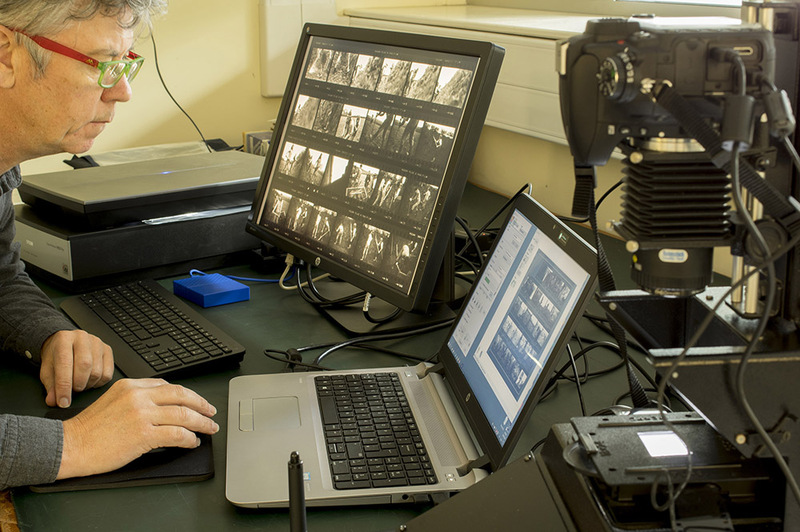 The archive of negatives is held in a climate controlled, fireproof, strong room at the Devon Heritage Centre in Exeter. This is where the negatives must be kept and downstairs in a conservators office is where I have my work place seen in the images above. James Ravilious started his commission from Beaford Arts to “show north Devon people to themselves”, in 1973, continuing the Beaford Archive started a year earlier through Roger Deakins (who became the great Hollywood cinematographer). The first two months of my contract have been spent scanning all 2306 of Ravilious’ contact sheets on an Epson Perfection V800 Scanner. This was the first stage of the process to archive the contact sheets digitally so that in the short term a curator can select approximately 9000 of his images for digitisation and in the long term the digitised contact sheets can be themselves searchable items in a database. Ravilious worked right from the start with an archive in mind; archivally processing his negatives as best he could (developing, fixing and washing his negatives in an often difficult, imperfect working environment) and numbering, filing and storing his negative bags and contact sheets. He also annotated his contact sheets on their face and rear indicating his prefered best images, description of place, name of subject etc. A small percentage of the contact sheets (and negatives) had been archively rehoused in separate new folders prior to my start which speeded up the digitising process. However once I got to view the contact sheet and negatives together in the same folder I noticed some negative strips and many ‘end of film’ negatives which didn’t make it onto the contact sheets – I started to make digital copies of these to add to the digitised contact strips but then abandoned this extra time-consuming work, marking negative bags with ‘post-it’ notes for later in the life of the project. There were 2 or 3 sets of negatives, and occasional single frames, which had yellowed through under fixing or inadequate washing at the original time of processing the film. These films are not archival and will not last in the long term and will need re-fixing and washing in the coming weeks. Although the negatives were all black and white I scanned them in colour to preserve the highlighted annotations, often in red pen. However, the drawback of the colour scan was often a slight colour shift towards green or blue, so a selective colour desaturation was applied in Photoshop afterwards. There were also handwritten annotations on the rear of Ravilious’ contact sheets which will need digitising and archiving later in the project. Today, photographing digitally, one gets used to getting a ‘correct’ exposure. Most people now shoot everything automatically and today’s technology enables us to achieve excellent exposures for most of our photographs. Even professionals, myself included, who use a camera manually, are used to checking our pictures at the time of shooting so that any adjustments to exposure can be made there and then. These same professionals will benefit from incredible advances in sensitivity to light when taking pictures, in comparison to the 100-400iso films used by Ravilious in the 1970’s – 80’s; and also shoot in RAW, benefiting from its greater exposure tolerance. 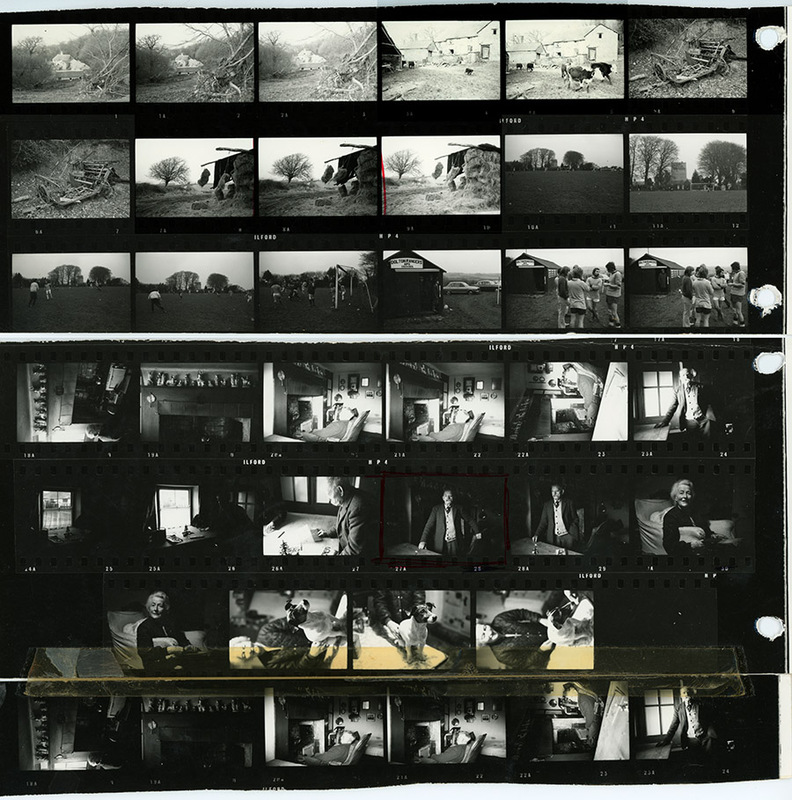 So it shouldn’t have come as a surprise to find James Ravilious’ contact sheets having both inconsistent exposure, one to the next, and having under and over exposure within a single film. But it did, because the last time I photographed on film was last century, and my last monochrome film was probably at the time Ravilious finished his work for Beaford Arts. Therefore, digitising James Ravilious’ contact sheets, preserving them archivally for eternity, was a greater task than it seemed. Each sheet needed slight adjustments to exposure at the scanning stage through tweaking the levels of the histogram. Each digitised sheet needed adjustments for some of its images. These adjustments were not to perfect the images, or ‘make good’ his exposure, but to enable a reader of the digital contact sheet to be able to see what the image was, and in the short term to enable the project curator to identify images (negative) to be digitised. I feel quite privileged to be one of probably only a handful of people to have seen 9,000+ of James Ravilious’ images, albeit small and with little detail, and to have gained an insight into his working practice through seeing 2,300+ of his contact sheets made in chronological order through his time at Beaford.